As the VC market has (in general) moved upstream to later and later-stage deals, angel investors have filled the breach by not only investing at the seed stage, but also carrying deals through to exit. As a result, an increasing number of angels are joining groups (like the Alliance of Angels). As these groups reach their capital capacity in a deal, the angels are reaching out to other groups with great deals for participation (it is generally called “syndication”). In a companion piece, I will discuss the regulatory framework changes needed to make this easier, but in this post, I want to address the logic and rationale for syndication of angel deals. So, what does this mean? In the lower left quadrant, there are groups/geographies that have lots of capital, but very few deals. They want to invest, but find very few local deals that merit that investment. These groups want to syndicate deals to see more good deals. Many areas in the country fit this category. Groups in these geographies often try to stimulate deal flow through either governmental programs or incubators. Areas and groups in the upper right quadrant have lots of good deals, but not sufficient capital to fund them. They want to syndicate their deals so that their good deals can be fully funded. The upper right quadrant have high deal flow and lots of capital. This might be typical of Silicon Valley. Groups here generally can fill their rounds, and so might not need to syndicate unless they want some specific expertise from people or groups in other areas. 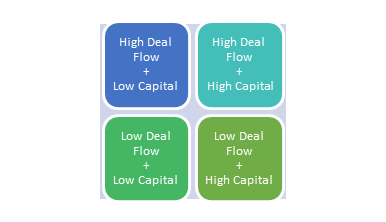 If you are stuck in the upper left quadrant with low deal flow and low capital, you are probably not in a good situation to form an angel group or do much formal angel investment. Hope this simple framework is helpful. Comments welcome as always.